It’s a bit early but One Manga has bid farewell to us all. While we still have the week to enjoy scantilations on the site, expect to see that all content to be gone by early next week (RIP OM July 2010) :(. 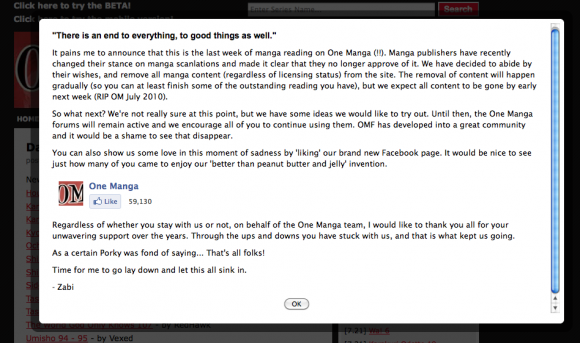 The decision to take down One Manga and it’s scantilation content comes from Manga Publishers who consider it a violation of their copyrights (hence the slinging of DCMA takedowns). While most of us will be moving on to other scantilation sites, it’s still sad to see One Manga go. I remember reading Air Gear (before it got moved), Strawberry Panic, Ouran Host Club and a slew of other titles on the site. 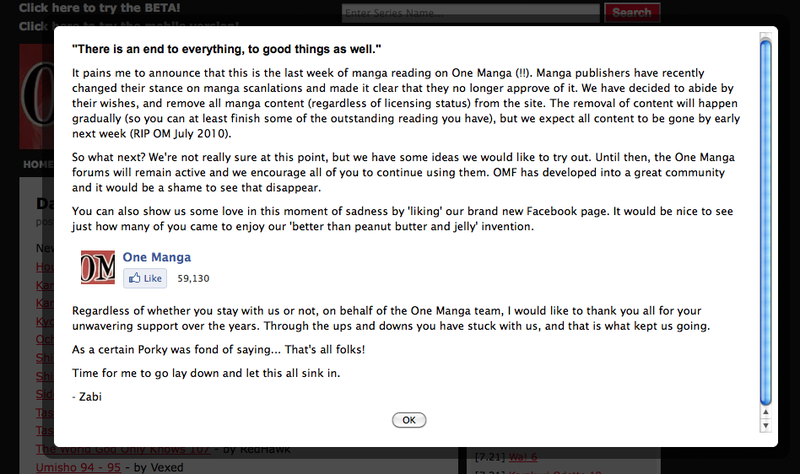 On that note however, one has to wonder if OM’s sister site (1000Manga) will also get hit by this decision. One Manga’s Facebook Page is located here.